THE REACCESSION OF TED SHAWN sprang from the experience of Adam H. Weinert when, in 2013, he was invited to reconstruct and reperform the early solos of pioneering modernist choreographer, Ted Shawn at the Museum of Modern Art as part of the exhibit, “20 Dancers of the XXth Century,” curated by Boris Charmatz. While researching the dances, Weinert discovered that Shawn made a gift of his works to MoMA in the 1940’s. The museum later gave these materials away, some to the newly formed New York Performing Arts Library and others to the Jacob's Pillow archive. This move contradicted MoMA's policy not to sell or give away works by living artists (Shawn was living at the time of his deaccession), suggesting that as a dance artist the museum considered his work outside its purview. With THE REACCESSION OF TED SHAWN, Weinert subversively returns the choreography of Ted Shawn to the institution he entrusted with its preservation. REACCESSION is accessed by a mobile app that uses Augmented Reality, a technology that enables audiences to find location-specific triggers throughout the museum to load Weinert's reconstructions of Shawn's works on their mobile devices in the exact location of their performances. Shawn's modernist solos, built from the physical images of the laboring man, reperformed with crystalline precision by Weinert and filmed by Philippe Tremblay-Berberri, are resituated in the open-access, participatory key of contemporary technology. This is an entirely new kind of reconstruction: a strange intersection of live modernist works with contemporary, technology-enabled approaches to audience experience. 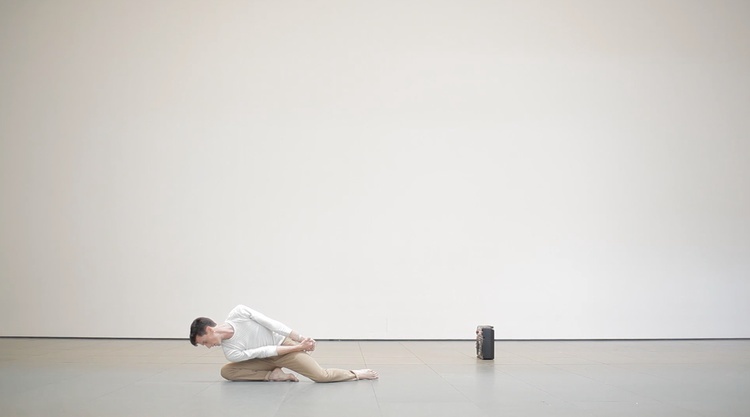 Weinert's museum pieces take shape both as embodiments of dance-historical material and as ghosts – dances superimposed on a space no longer inhabited by the dancer – bringing a welcome challenge to dance's interaction with the museum as well as new horizons for the preservation and dissemination of this ephemeral form outside its rarely-accessed archives. Turn your smartphone into a time machine by following the directions on this website, which will lead you through the museum's five floors. The mobile app will recognize architectural details and museum signage to trigger the digital installation. The MoMA map is also rigged within the app, allowing you to take aspects of the installation home with you or view them online. In the third and final phase of the installation, “Without Consent” (active August 5th-September 2nd), you are invited to co-create content by adding your own impressions, performances, and critiques to the installation. This projects uses the Dance-tech TV AR App and is realized as part of the first Dance-Tech Augmented Reality Artist in Residence Program. Special Thanks to Ella Baff, Executive and Artistic Director of Jacob’s Pillow, and to Norton Owen, Director of Preservation at Jacob’s Pillow without whom this project would not be possible. To Marlon Barrios Solano at Dance-Tech for providing the Augmented Reality Platform and conceptual support. And to the The Dalton School and the Shelter Island Historical Society for providing rehearsal and residency support. Thank you to R.B. Schlather, Ava Eisenson, Aslan Rolston, Lisa Weinert and Josephine Hemsing. The Dance-tech AR app is powered by Aurasma. The initial exhibition at MoMA, “20 Dancers of the XXth Century” was organized by Ana Janevski, Associate Curator, with Jill Samuels, Performance Producer, Martin Hartung, and Leora Morinis, Curatorial Assistants, Department of Media and Performance Art. In collaboration with Boris Charmatz, Director, Sandra Neuveut, Deputy Director, and Martina Hochmuth, Production Director, Musée de la danse/Centre chorégraphique national de Rennes et de Bretagne. The project was made possible by MoMA’s Wallis Annenberg Fund for Innovation in Contemporary Art through the Annenberg Foundation. The Museum acknowledges generous support from The Cultural Services of the French Embassy in the United States.